The Day dedicated to the patroness of Sant'Agata Bolognese is a festive occasion for the whole town, that celebrates with a street market in the historical center, including stalls of merchants, typical products and shows. The event is a perfect occasion to taste the Ciambella di Sant'Agata , a traditional homemade cake (doughnut) that in this edition will be enhanced in its original recipe by a dedicated food stall. 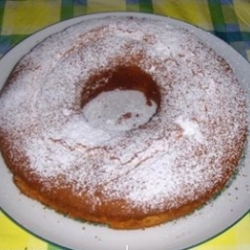 The cake is also called "brazadèla tèndra” (soft cake) to distinguish it from the “brazadela dura“ (hard cake), prepared elsewhere with the same ingredients but with different proportions and workmanship. Together with Ciambella di Sant'Agata, the food stall will also prepare another typical sweet: the rice pancake. The street market will propose tastings of certified wines and food, clothing and household products. This year the day of the Patroness will also feature the local Farmers' Market (Al marchè dal cuntadein), which is normally held every first Sunday of the month. The event is also an occasion to visit the historic centre of Sant'Agata Bolognese, rich in historic monuments, and the Lamborghini Museum, part of Land of Motors network.